Need something to help your business stand out from the crowd? 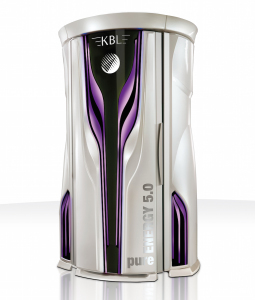 Adding the KBL pureENERGY 5.0 from PC Tan to your tanning business is one sure way to “stand up” to your competition and draw in clients looking for a next-level tanning experience. It’s a new generation. Power has always been cool, and with total lamp wattage of 10,400 and 10-minute maximum sessions, the pureENERGY 5.0 certainly isn’t lacking there. But in 2018 there’s nothing cooler than energy efficiency. This unit provides both, with High Power Efficiency electronic ballasts for more power while reducing energy consumption and heat development. The new-age experience continues as megaVoice technology guides tanners through a perfect experience every time, and they manage the additional functions on the easy-to-use, hygienic, scratch-resistant LCD glass touchscreen. The inherent benefits of a standup booth, coupled with advanced features, deliver first-class comfort. Everything is faster in the future, and the pureENERGY 5.0’s 10-minute sessions are no exception. ACS intelligent technology ensures a gentle startup and soft shutdown, and the powerful bodyCool fan neutralizes the heat and maintains a soothing zone during tanning sessions. Mind and body are always at ease with great tunes controlled with MP3, SD card audio system and volume control with optional Bluetooth connectivity. You will finally get those base-level tanners to open up their wallets when they step in the salon and experience the “wow” factor of the pureENERGY 5.0. Just leave the tanning room doors open and let its 7-color LED exterior illumination draw them into the future of tanning. Once they see that the advanced tanning features match the futuristic design, they’ll be too pleased to go back to the normal sunbeds, and you’ll be thrilled with the difference it makes in revenue.